…and so do many hundreds, NO THOUSANDS of others. And I know this because I just spent my last Saturday in NY in a Verizon Wireless store listening to all the other angry customers. So, last week, I get my “refurbished MOTOKRZR” and guess what? It STOPS WORKING altogether when I’m on my trip to Chicago while Bella is having a nervous breakdown about the Mt. Vesuvius on her face and I have 24 hours to go before I get home. In a way, it’s better and someone else can deal with her 15 year old hood, but now, how the hell I am going to reach my clients? DAD: No way, cause then it’s going to cost us $50 more per month. Just get the battery. MOM: But the battery KEEPS DIEING. And they said that he could upgrade and still stay on the family plan. DAD: That’s not what I HEARD. YOU HEARD WRONG. MOM: But what if YOU upgrade and we give him the PHONE. DAD: I AM NOT DOING THAT TODAY. I need to take over the cell phone responsibility. MOM: NO WAY. The last time you did that, you lost a $300 phone. KID: You lost it in the cab. Dad storms out. Kid to mom: Dad’s GONE!!!!! MOM TO KID: He’s such a child. He’s worse than YOU. WHAT DO YOU MEAN, THEY DON’T HAVE MY BATTERY???? And I’m like, “are they FRIGGIN’ kidding me? 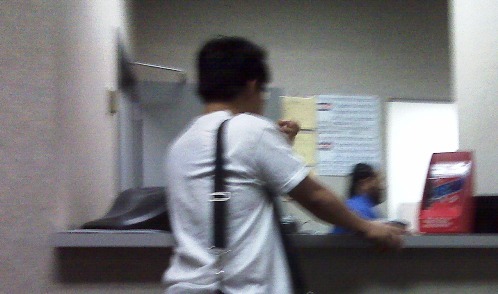 ?” (sorry for all the blurry pics, it’s just a little difficult to take a Blackberry photo of people you are spying on). But anyway, I get home, thinking my 2 days spent with Verizon over the last year is finally ended. Then I go to charge the phone and after 10 tries, figure out they gave me the WRONG CHARGER. And I just have to wonder, why there aren’t armed guards standing outside all Verizon stores because one of these days that husband is going to come back and take care of the person who really wrecked his marriage. 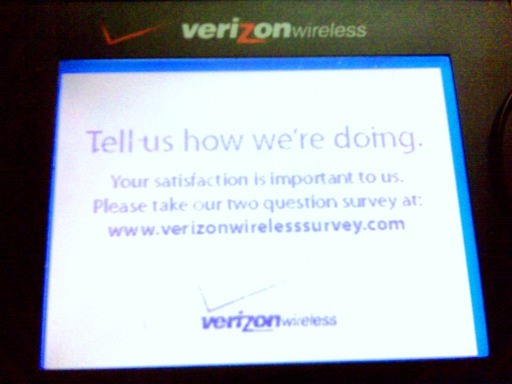 I have to admit, I have a great relationship with Verizon, ever since I stopped using Motorola phones. I think most of the time it’s the device and not the provider that causes the most grief. Try an LG phone and you might just find that your problems go away. For instance, my wife has the RZR (Razor, whatever… POS, I say) and I have the LG Chocolate Flip phone. From day one not only did I have better service and reception while occupying the same space, but the “trendy” Motorola phone had a much slower reaction time resulting in a crap user experience while the LG phone was snappy! Though I must concede that I would rather skip the Verizon stores altogether as the actual human service is shoddy at best. You know me, I’m not ad whore but I have had great experience with the combo of LG and Verizon. Though I know you travel a lot more than I do. I would never even consider going to a place called “Water Taxi Beach”. Sheesh. thanks short! I did just switch to the LG. And hopefully, it will work out better! But STOP. I just had to GO TO water taxi beach. where else is there sand in Manhattan??? Short: The LG broke after 6 months. GRRRR.